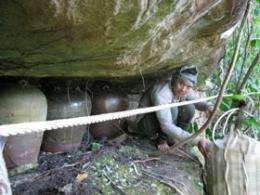 The Otago researchers have now provided the first radiocarbon dates for unusual jar and log coffin interments on exposed ledges high in southern Cambodias rugged Cardamom Mountains. Since 2003, they have been working to geo-locate and survey 10 interment sites and to date these using samples of coffin wood, tooth enamel and bone. With colleagues from Cambodia, Australia, USA and Scotland, Drs Nancy Beavan and Sian Halcrow of the Department of Anatomy have just published the dating of four sites in the journal Radiocarbon. These reveal that the mysterious funerary rituals, which are unlike any other recorded in Cambodia, were practiced from at least 1395AD to 1650AD. Dr. Beavan, who is currently in Cambodia, says that this period coincides with the decline and fall of the powerful Kingdom of Angkor, which was seated in the lowlands. To date, the bulk of research that makes up what is known about cultural history of the Khmer regions has focused on the lowlands, she says. Through our work we hope to broaden the understanding of this history beyond the legacies of the great Khmer Kingdom alone to those who lived within its margins, she says. Dr. Sian Halcrow says that archaeological findings from another of the 10 sites, which she and Dr. Beavan are currently preparing for publication, will offer important new clues about who these mysterious people were, their culture, trade connections and biological adaptation to the environment. Given the rugged and remote locations of the sites, the fieldwork has not been without its challenges, Dr. Beavan says.